The Long Term Ecological Research Network (LTERN) integrates key established plot networks across Australia to tackle critical questions associated with the impacts of disturbance on Australian ecosystems. LTERN brings together some of Australia’s leading ecologists. Formally established in 2012, LTERN draws together a range of existing long-term ecological monitoring programs to examine Australian ecosystems in new ways. LTERN is composed of 12 ecological plot networks across Australia that have been actively monitored for several years and in some cases decades. 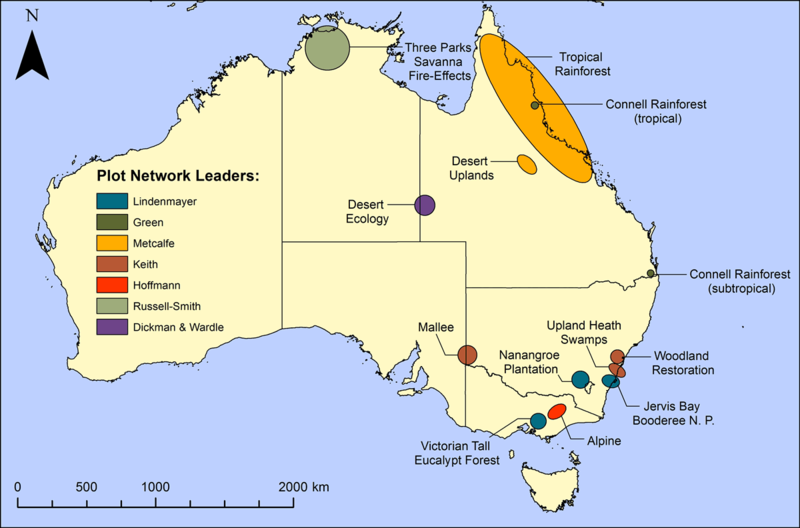 These plot networks span a number of ecosystems including tropical savannas, tall eucalypt forests, mallee woodlands and shrublands, alpine regions, and deserts. The networks also cover multiple land tenures and land uses including plantation forestry, conservation, restoration, tourism and agriculture. These networks are designed to monitor biodiversity and better understand disturbance regimes associated with fire, logging, livestock grazing, invasive species, extreme weather events and climate change. LTERN is migrating to complete packages. A complete package is a dynamic collection bringing together, as single publication, all spatial data, background data and project data pertaining to a single time series dataset. Now there will be a single complete package for each data time series, which is updated as more data becomes available. Complete packages undergo additional curation over background packages and project packages in order to homogenise all data tables. A complete package contains all the data for a time series and therefore supersedes and replaces previously published packages. Previously published background packages, project packages and spatial package will be withdrawn from future discovery as complete packages replace them.